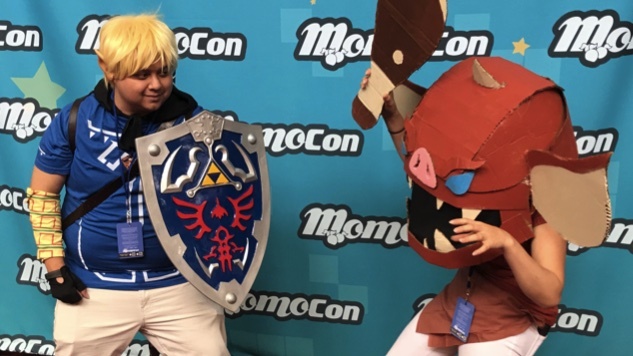 So when he found out about Momocon, a convention for fans of anime/animation, manga/comics and gaming, 20 minutes from our house, he had to go. Every so often, Eli will introduce me to a show he loves to try and get me hooked. The most successful attempt was RWBY, an American anime-style series of five- to 15-minute episodes released by Rooster Teeth on YouTube. We watched the first four volumes before Volume 5 premiered last fall, and for months, we had a Saturday ritual of sitting down together and catching the latest chapter before he’d play me one of his favorite RWBY Chibi spin-off videos. At Momocon, a panel of fans dressed as RWBY characters performed improv skits based on audience ideas. It was a time of inside jokes among a group of strangers with a shared love for characters their friends and family may not know. For Eli, it was an affirmation that his people, just as passionate about this YouTube series, were out there. At one point, a few fans, including Eli were invited up on stage as volunteers. He didn’t know what he was volunteering for, but it was the opportunity to take part in an improv activity where the moderators or volunteers could tap into the scene. I was surprised to see my shy kid bravely tap into the scene and get the biggest laugh from the crowd.